(This note should not go to PlanetMySQL, sorry if it goes). We again have problem with comments to blog posts. It’s technical problem, we did upgrade some components and it seems it affected captcha. We are working on fix. We are sorry for the inconvenience and thank for reports about the problem. Recently I was doing a little work for a client who has MyISAM tables with many columns (the same one Peter wrote about recently). The client’s performance is suffering in part because of the number of columns, which is over 200. The queries are generally pretty simple (sums of columns), but they’re ad-hoc (can access any columns) and it seems tailor-made for a column-oriented database. I decided it was time to actually give Infobright a try. They have an open-source community edition, which is crippled but not enough to matter for this test. The “Knowledge Grid” architecture seems ideal for the types of queries the client runs. But hey, why not also try MonetDB, another open-source column-oriented database I’ve been meaning to take a look at? What follows is not a realistic benchmark, it’s not scientific, it’s just some quick and dirty tinkering. I threw up an Ubuntu 9.04 small server on Amazon. (I used this version because there’s a .deb of MonetDB for it). I created a table with 200 integer columns and loaded it with random numbers between 0 and 10000. Initially I wanted to try with 4 million rows, but I had trouble with MonetDB — there was not enough memory for this. I didn’t do anything fancy with the Amazon server — I didn’t fill up the /mnt disk to claim the bits, for example. I used default tuning, out of the box, for all three databases. The first thing I tried doing was loading the data with SQL statements. I wanted to see how fast MyISAM vs. MonetDB would interpret really large INSERT statements, the kind produced by mysqldump. But MonetDB choked and told me the number of columns mismatched. I found reference to this on the mailing list, and skipped that. 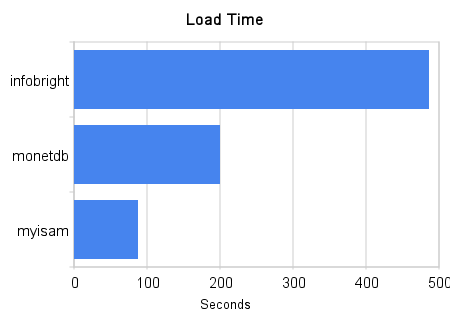 I used LOAD DATA INFILE instead (MonetDB’s version of that is COPY INTO). This is the only way to get data into Infobright, anyway. I ran each query a few times, discarded the first run, and averaged the next three together. A few miscellaneous notes: don’t forget that Infobright is not just a storage engine plugged into MySQL. It’s a complete server with a different optimizer, etc. This point was hammered home during the LOAD DATA INFILE, when I looked to see what was taking so long (I was tempted to use oprofile and see if there are sleep() statements). What did I see in ‘top’ but a program called bhloader. This bhloader program was the only thing doing anything; mysqld wasn’t doing a thing. LOAD DATA INFILE in Infobright isn’t what it seems to be. Otherwise, Infobright behaved about as I expected it to; it seemed pretty normal to a MySQL guy. MonetDB was a bit different. I had to be a bit resourceful to get everything going. The documentation was for an old version, and was pretty sparse. I had to go to the mailing lists to find the correct COPY syntax — it wasn’t that listed in the online manual. And there were funny things like a “merovingian” process (think “angel”) that had to be started before the server would start, and I had to destroy the demo database and recreate it before I could start it as shown in the tutorials. MonetDB has some unexpected properties; it is not a regular RDBMS. Still, I’m quite impressed by it in some ways. For example, it seems quite nicely put together, and it’s not at all hard to learn. It doesn’t really “speak SQL” — it speaks relational algebra, and the SQL is just a front-end to it. You can talk XQuery to it, too. I’m not sure if you can talk dirty to it, but you can sure talk nerdy to it: you can, should you choose to, give it instructions in MonetDB Assembly Language (MAL), the underlying language. An abstracted front-end is a great idea; MySQL abstracts the storage backend, but why not do both? Last I checked, Drizzle is going this direction, hurrah! EXPLAIN is enlightening and frightening! You get to see the intermediate code from the compiler. The goggles, they do nothing! From what I was able to learn about MonetDB in an hour, I believe it uses memory-mapped files to hold the data in-memory. If this is true, it explains why I couldn’t load 4 million rows into it (this was a 32-bit Amazon machine). The SQL implementation is impressive. It’s a really solid subset of SQL:2003, much more than I expected. It even has CTEs, although not recursive ones. (No, there is no REPLACE, and there is no INSERT/ON DUPLICATE KEY UPDATE.) I didn’t try the XQuery interface. Although I didn’t try it out, there are what looks like pretty useful instrumentation interfaces for profiling, debugging and the like. The query timer is in milliseconds (why doesn’t mysql show query times in microseconds? I had to resort to Perl + Time::HiRes for timing the Infobright queries). I think it can be quite useful. However, I’m not quite sure it’s useful for “general-purpose” database use — there are a number of limitations (concurrency, for one) and it looks like it’s still fairly experimental. I launched a new Symfony User Group for the german area Stuttgart, Ludwigsburg and Heilbronn. Everyon who is interessted can join us via http://symfony-usergroup-schwaben.mixxt.de. We will try to hold regular meetings in the future as soon as we have enough members. The CPD task is incorporatated in the current Phing trunk. If you want to use it you need to checkout the Version2.4.0 RC at the moment. The PEAR Installer version doesn’t contain the Task at the moment. How number of columns affects performance ? It is pretty understood the tables which have long rows tend to be slower than tables with short rows. I was interested to check if the row length is the only thing what matters or if number of columns we have to work with also have an important role. I was interested in peak row processing speed so I looked at full table scan in case data fits in OS cache completely. I created 3 tables – First containing single tinyint column which is almost shortest type possible (CHAR(0) could be taking less space), table with 1 tinyint column and char(99) column and table with 100 tinyint columns. The former two tables have the same row length but have number of column different 50 times. Finally I have created 4th table which is also 100 columns but one of them is VARCHAR causes raw format to be dynamic. I populated each of the tables with 12M rows. Getting 7 bytes row size for first table and 101 byte for second and third. I used simple scan query: select max(t1) from t100; for the test. This shows there is surely the problem with dynamic row format table with many columns. But is it because of large number of columns or dynamic format on its own is slave ? So there is surely the penalty for dynamic rows, however it is not very significant if number of columns is small. For large number of columns dynamic rows become very expensive and you have to watch out. I have not looked at the code and would appreciate any developers comments but I guess for dynamic rows tables certain conversion has to take place when internal data structures are populated (everything but TEXTs/BLOBs is fixed length when it is being processed). This conversion process depends on number of columns while for fixed rows the MyISAM storage format matches internal one so you can basically do memory copy which does not depends on number of columns. Another interesting observation is access speed to different columns. the max(t1) and max(t99) were taking the same time which means there is no penalty for accessing column which is in the end of the table rather than at the start when it comes to MyISAM. As you can see the index scan is not as fast as table scan scanning about 3.7M rows/sec but which is still pretty fast. 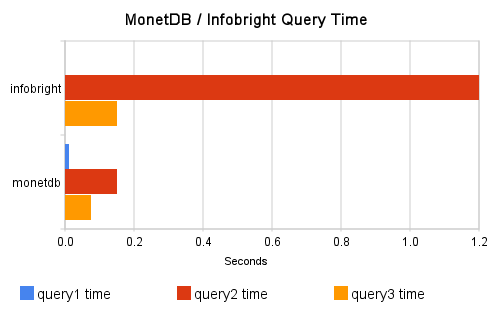 As you can see Innodb is a lot slower and has behavior similar to Dynamic Row tables in both cases. This is because Innodb does not store data in native MyISAM format and conversion is needed in all cases. We can also see the table scan speed can be up to 5 times slower, for very short rows – some of this goes back to the fact Innodb rows have a lot of transaction control overhead attached to them. Also note the covering index scan speed is very similar to full table scan speed – this is rather expected as table data is stored in BTREE index very similarly to how indexes are stored. Summary: Beware of dynamic row format tables with many columns they might bite you with surprise slowdown. 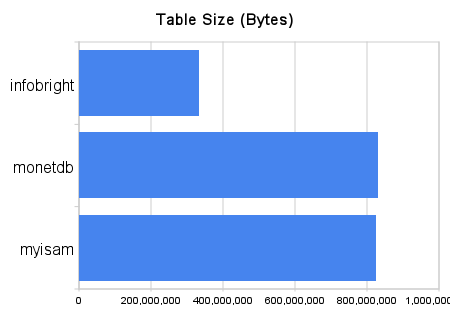 MyISAM is much faster than Innodb when it comes to in memory full table scan. P.S Tests were done on MySQL 5.4.2 on Intel(R) Xeon(R) CPU E5405 @ 2.00GHz CPU. This is a very old draft, from early 2007 in fact. At that time I started to look into something interesting with the index cardinality statistics reported by InnoDB tables. The cardinality varies because it’s derived from estimates, and I know a decent amount about that. The interesting thing I wanted to look into was why the cardinality varies in a particular pattern. Look at the distribution of the counts. The weighted average of these is 1000.53, so it’s close to the truth (1000 rows). But five of the eight distinct estimates are shown about one-half as often as the others; it looks like the random choice of which statistic to use is not evenly distributed. I mentioned this to Heikki and he pondered it for a bit — but neither of us really figured out what was going on. I know the code superficially, but not as well as he or Yasufumi or others do; and I was not able to find a cause. More recently I saw that I’m not the only one who notices oddities in the random number generation. I waited. And indeed the fixes for that bug seemed to have fixed the skew in the statistics. Case solved, and all I had to do was wait. Truly, laziness is a virtue. Our Santa Clara/San Francisco training went great – 100% of survey respondents said they would recommend the same course to a friend. I’m pleased to announce that such an opportunity exists – our next training location will be New York City on October 30, 2009. We’ve booked a training venue in the financial district of Manhattan (90 Broad Street New York, NY 10004), and it seems like a great opportunity to switch from using hotels to teaching in real classrooms. This means that every student will have a (Linux) computer provided, and the instructor will have a whiteboard to be able to scribble. With the class size going down, we have a little freedom to tweak our format. One of those changes is that we plan to increase time for exercises in class just a little bit more. Tickets are $450/student, and we’re continuing our early bird special (a copy of High Performance MySQL 2nd Ed). Interested in signing up? Registration is open! This will mark my first trip to Russia – and oh boy am I excited. I’m taking a few days vacation after so I can tour around Saint Petersburg. Want to say hello? Let me know at morgan-at-percona-dot-com! * Yes, this is the same as our InnoDB course we taught last week in Santa Clara and San Francisco. More venues are coming in the next couple of days – wait for another blog post! I spend large portion of my life working on MySQL Performance Optimization and so MySQL Optimizer is quite important to me. For probably last 10 years I chased first Monty and later Igor with Optimizer complains and suggestions. Here are some general ideas which I think can help to make optimizer in MySQL, MariaDB or Drizzle better. Make it Plugable Every Major optimizer change causes a lot of pain for some of the users. Even if you improve performance 99 our of 100 queries there are going to be countless users complaining about the change. Due to this problem Optimizer Team was more conservative than I think they could have been. The solution is simple – make optimizer pluggable and make it possible to stick to old optimizer behavior with new MySQL Version. Make Cost Model Adjustable MySQL Optimizer looks at query plan in terms of disk IOs/Seeks in same way for all data sets. In practice some people have their database 100% in RAM (even for Disk tables such MyISAM or Innodb) others keep database on SSD which has completely different ratio between CPU and IO cost. Focus on Execution Methods Performance problems can be due to optimizer picking the wrong plan, such as doing full table scan when Index access is better or because MySQL simply does not have execution method to resolve query in optimal way – loose index scan, hash join, sort merge join are all the examples of such. For me it is most important to ensure MySQL has proper ways to execute the query. It may not always pick them right but at least it allows to get query going right manually. Zero Administration Tunables and Hints Zero Administration is great. I would love to see Optimizer which always choses the fastest plan for the query (not the plan with lowest “cost” but the one which actually gives best performance). I also recognize there are always going to be cases when Optimizer will not pick the right plan. So I would like to see tuning knobs (which relates to cost model and various optimizations) as well as simply hints. Any way MySQL could possibly execute query should be possible to force with hints. In MySQL 4.0 this was the case, in recent versions number of optimizations have been added which can’t be easily forced with hints. Another benefit of having ways to force any optimizer behavior with hints (rather than by changing the code) is the data Optimizer Team can get back from customers and community – it because very easy for users to show there is the plan which works better and so let the team know which cases are not handled best by the optimizer logic.